Thousands of demonstrators gathered Saturday in the Romanian capital Bucharest for a second straight day, after more than 450 people were hurt and around 30 arrested in a huge anti-corruption protest. Police came in for criticism after they used water cannon and tear gas on Friday to disperse protesters as tens of thousands rallied to call on the leftwing government to resign. 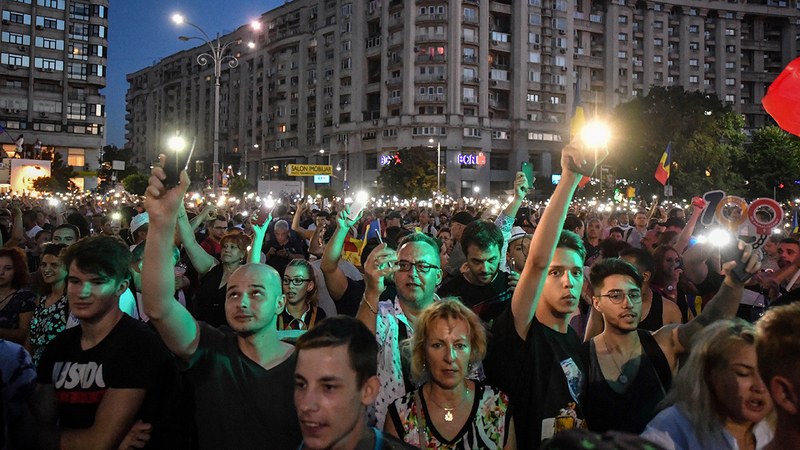 Thousands gathered in central Bucharest on Saturday evening, some carrying Romanian flags, with demonstrators insisting they would not be cowed from protesting despite Friday’s violence. “I came after seeing what happened on Friday on television — the brutality of the police against peaceful people,” said Floarea Toader, 64, the national yellow, blue and red flag draped across her shoulders. “My children work in Spain and they would like to come back. Around four million people have left the country — one of the European Union’s poorest — in the last 15 years, seeking a better life than that offered by Romania’s average monthly wage of just 520 euros ($590). Austrian Chancellor Sebastian Kurz, whose country currently holds the EU rotating presidency, criticised the violence, which also saw a cameraman for Austria’s public broadcaster hurt. “We strongly condemn the violent clashes in Bucharest where numerous demonstrators and journalists were injured. We expect full explanations,” he said on Twitter. Romania’s centre-right President Klaus Iohannis, a critic of the government, said he “strongly condemned the brutal intervention of the police, which was disproportionate to the attitude of most demonstrators” but added that “any form of violence is unacceptable”. Prime Minister Viorica Dancila, in turn, accused Iohannis of “inciting the population against the authorities” and “using the dramatic effects of the events”. In a controversial move last month, Romania sacked top anti-graft prosecutor Laura Codruta Kovesi — considered a symbol of the country’s fight against corruption. With Kovesi at the helm, the Anti-Corruption Prosecutor’s Office (DNA) had led a crackdown on corruption among local and national elected officials, earning the enmity of many in Romania’s political class and prompting critics to accuse it of abuse of power. Before Kovesi’s sacking, thousands of protesters took to the streets in support of her. There have also been long-running waves of protests against judicial reforms — at their peak drawing an estimated half a million people nationwide in February 2017.